Please feel free to contact our office to learn more, raise an issue or provide a comment. We do not handle any hiring for the oil sands projects; please contact the companies directly. We does not handle public requests for oil sands tours. Tours of the oil sands industry are arranged by Fort McMurray Tourism. Oil sands are deposits of bitumen, thick, heavy black oil that must be upgraded before it can be used by refineries to produce consumer products such as gasoline and diesel fuels. 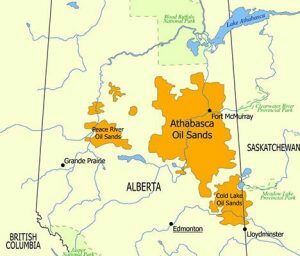 Alberta’s bitumen deposits are sometimes erroneously referred to as tar sands but the correct terminology for the resource is oil sands. Tar is a refined substance, while the bitumen contained in the oil sands is naturally occurring.